What’s a #hashtag? What’s a @handle? Who tweeted what? Wait, what’s a tweet? Using Twitter requires an understanding of some basic Twitter terminology which, in most cases, is specific to Twitter. Similar to our Facebook Business Page annotated graphic, here’s one for a Twitter page, complete with the applicable parts and their definitions. Plus, just because we like to, we added a little bit of rationale to each, to make sure you understand why they’re all important to building your brand and engaging folks on Twitter. For purposes of illustration, we’re using actor/comedian/musician/all-around awesome guy Steve Martin’s Twitter page to show you these different parts. Scroll below the photo to see the explanation for each highlighted area. Note – you can also click on the photo to see a larger version. Home Page. This is the home page for your Twitter account, and it shows all of the posts from people you’re following, also called a Timeline. Me Page. This is where you can see your profile, edit your profile, and see all the tweets that you’ve made and tweets in which you’ve been mentioned. (More on that below.) The page we’re looking at below is essentially Steve Martin’s version of his Me page. Profile Photo. This is the square thumbnail image which appears next to each tweet you make, and also appears here in the header of your page. It’s recommended that your photo be 500 x 500 pixels. It might be a great place for a logo, since that thumbnail will always show up next to all of your tweets, and that will then appear in followers’ timelines on their home pages. Header Photo. A customizable rectangle behind the profile information and photo. In this case, Steve has chosen not to have something behind his profile photo. But the options are pretty open here; recommended dimensions for this photo are 1252×626, with a maximum file size of 5 MB. Make sure you use a dark background – Twitter’s description fields (see below for more) will be in light-colored text, so you run the risk of having your text disappear. Background Photo. This is also customizable; for example, you can upload your own image (perhaps with marketing information on it? ), or you can choose from a variety of Twitter options. Note that the background stays stationary no matter how much you scroll up or down on the page. For more information about how to design a background photo, including dimensions and tips for optimization, check out this article on Digital Trends. Handle. This is the primary name of the account. For example, we’re @NoelleMarketing. Steve Martin’s handle is @SteveMartinToGo. (Worth following, by the way.) While the name “Steve Martin” is technically the account name, the handle is really the name that you care about – because that’s what people use to talk to you or about you. So in this case, the phrase “@SteveMartinToGo” is what another Twitter user would include in their own posts to mention him or his page. Note – the little blue and white check mark next to his name means that Twitter has reached out to him and has verified that, yes, this is indeed the REAL Steve Martin, and not an impostor account. Your Profile Description. This is where you can say who you are and what you want the world to know about you or your brand. It also give you spaces to enter in your physical location and your website. Follow. Twitter users “Follow” each other. Much as they would “Like” or connect with a person or business on Facebook, a person decides to follow someone else’s Twitter account, so that they see that account’s updates and tweets. I can decide to Follow someone else; I might Unfollow them; and I also myself might have Followers (people who want to see what I’m tweeting about). 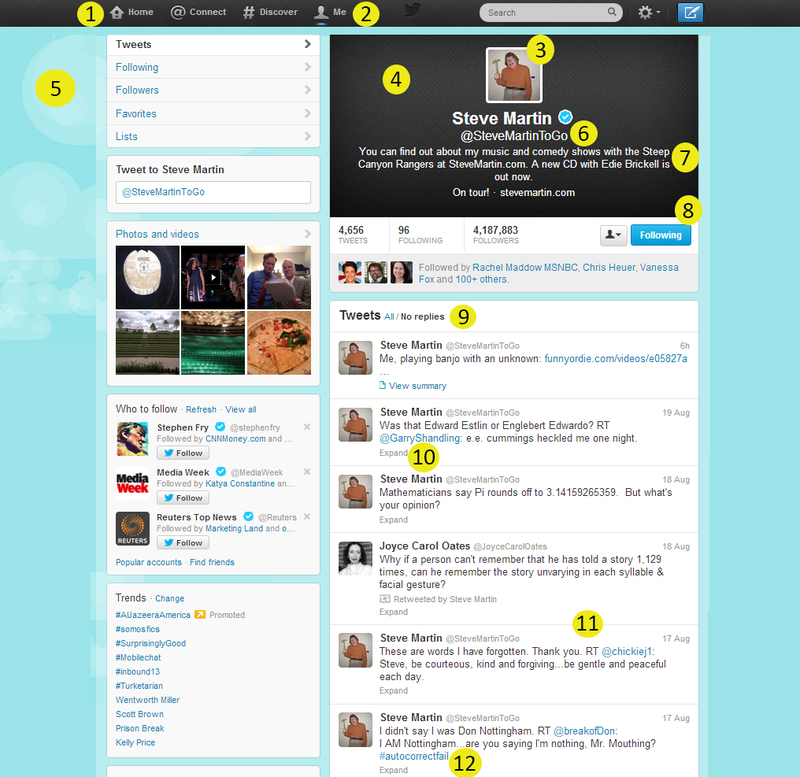 I’m totally following @SteveMartinToGo, by the way. Tweet. This is the actual post, which is a Tweet in the Twitter universe. The list of all of your tweets is found on this page, which in the Twitterverse is called your Me page. Retweet. A follower of yours can see a tweet they like, and retweet it to their own followers. This is similar to sharing a Facebook post, and Twitter automatically inserts an RT into your re-tweet. Or, you can re-tweet a tweet you liked. This is a great way to get your followers to find other accounts they might be interested in, and vice-versa. With some practice – and by following other accounts – you quickly build up your Twitter following and get your brand out there. For a similar article on Facebook, see our Facebook Business Page annotated graphic.